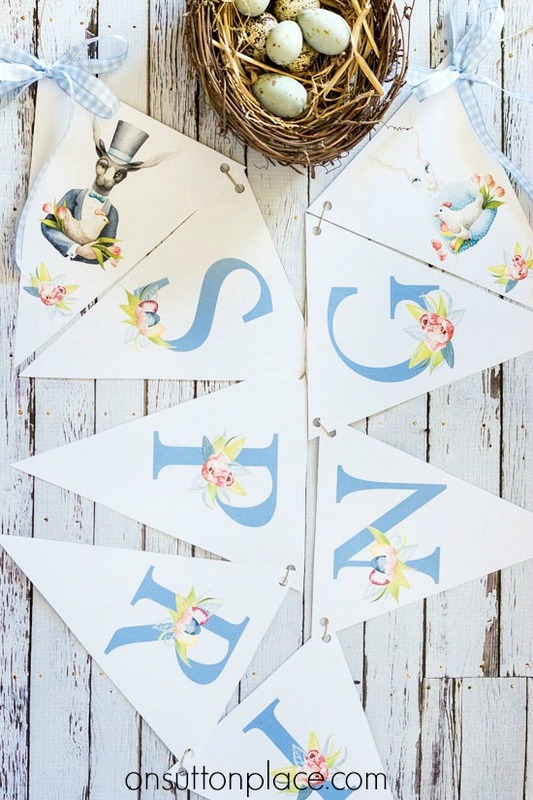 DIY Happy Easter Banner Printables | Just print the floral letters, cut out and hang. Easter decor that’s easy and quick! 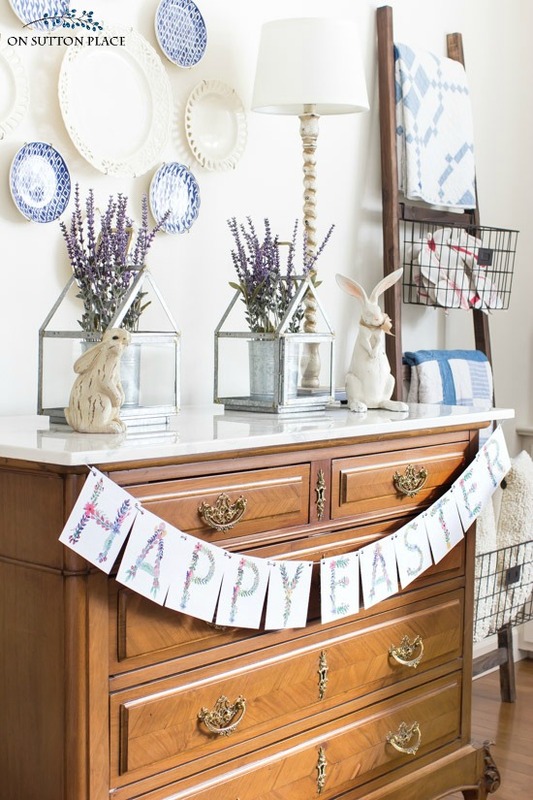 Today I’m sharing some fun Easter decor…but not the usual bunnies and eggs. (Not that I don’t like bunnies and eggs, because I do!) 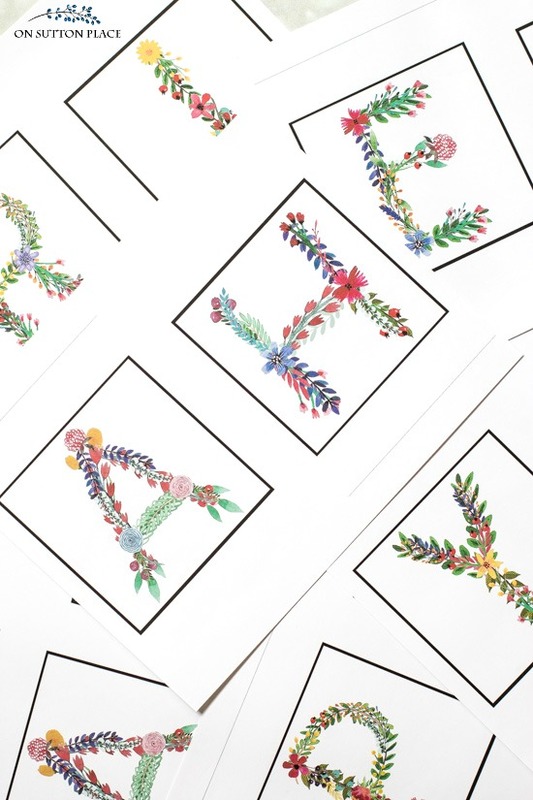 A while back, I designed a watercolor floral alphabet that is actually printables (and not a font.) 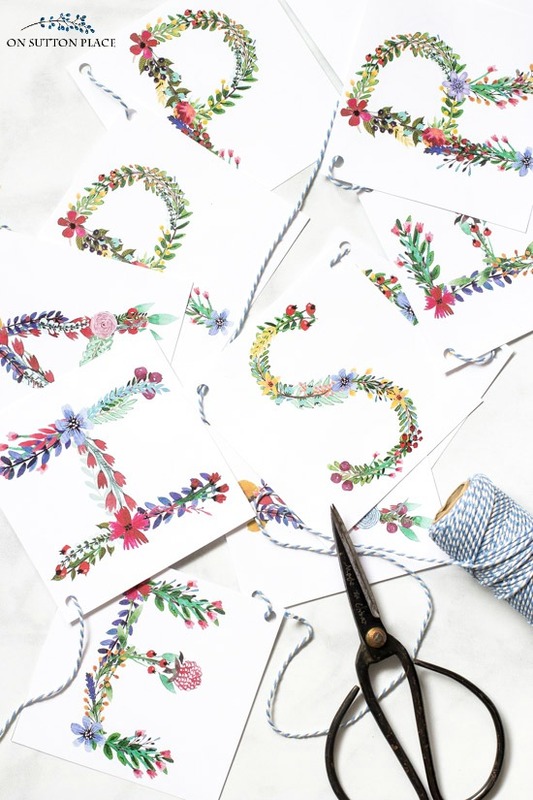 These printables are perfect for banner-making, DIY wall art, cards, crafts, and more. 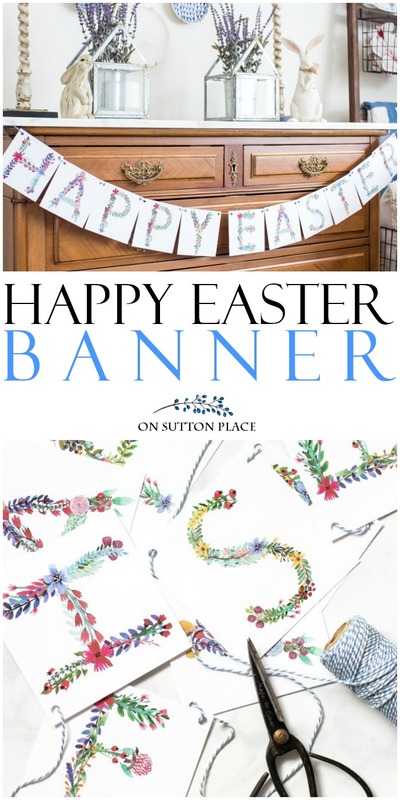 I have made many seasonal banners and wanted to share the latest one…a DIY Happy Easter Banner. *Some links lead to websites where I am an affiliate. Click [HERE] for my disclosure statement. All together, from printing to weaving the twine, this project took less than an hour. Plus…this is something you can keep if it’s stored properly. There’s no reason that you can’t use this as part of your Easter decor for years to come…if you want to! For more information about the floral watercolor alphabet, just click the button below. « How to Hang Curtains like a Pro! LOVE them!! Thank you for sharing. Hello Ann, Thanks so much for sharing all of your wonderful creative ideas! Love your website & blog! I have a question for you… wondering where you purchased the antique looking scissors shown above that I frequently see in your posts. Would love to get a pair of those. Thanks again! Hi Sally! I actually got those on eBay a few years ago. They are hard to find in antique malls or flea markets. I looked for a long time but never found any. They are technically for trimming bonsai. If you go to eBay and search “vintage bonsai scissors,” a nice selection comes up in varying prices. I hope this helps! Thank you Ann for your quick reply! I appreciate the info and will take a look on eBay. I always look forward to your new decorating ideas, recipes, and printables! You are so creative! Take care. So cute, and I truly adore the font of the letters. Precious! Such beautiful letters!! Thanks so much for sharing! This is gorgeous! Thank you so much. I am thinking I will make mine using printable fabric. Thank you so much. I have been trying to decide on a banner for over a week. Bunnies and chicks, etc. These are so perfect, Will have it hanging by tomorrow. I will probably be purchasing the set later as it would make a perfect Spring banner. Love & Light. Ann- another stunning project! Just want to remind you that you are in our hearts. Have a lovely day. the letters are beautiful, and your banner looks great. Ann, thank you! Once again, you’re adding delight to our home! These will decorate both my home and my daughter’s–they are perfect. I’ve also made a spring basket for the door, and your printables are on my walls. You are such an inspiration! Thank you for sharing your talents! I love the colors, very vibrant and you use it the letters for holidays and celebrations. Thank you bunches- going to laminate mine! Thank-you for such a beautiful gift. I know just how I will use it. You are very kind to share it with us. Such a pretty banner!!! Love your idea; quick, easy, and eloquent. Thank you for sharing. This is so pretty Ann! I love the happy colors. Cute as every and I agree printing on card stock makes the images look like art :) It’s so darn cute! Love the printables. Actually, a bit of relief from bunnies and chicks, although I too like them. I’m always up for something fresh and new. Thanks so much! Ann, I look forward to your creative blogs that are abundance with inspiration. It is like receiving a special note from a dear friend. I welcome them with open heart. You have inspired me with so many of your projects. I enjoy making gifts for my girlfriends for each season, and there is always something in these gift packages from your blogs. I’ve created the red ticking tea towels for valentines, the small bunny burlap profile pillow with ribbon bow at his neck for Easter, the ‘I’m Thankful’ paper chain for Thanksgiving, and at Christmas this year I braved to work with clay and made each friend a set of star ornaments with their name stamped on them. I selected a few of my grandmother’s crocheted and tatted scarves and rolled the designs into the clay. They were beautiful! My friends will have the floral Easter banner in their package they will receive next week. Thank you sweet friend. Sending Easter Blessings your way. they’re beautiful and shout spring; thanx for sharing! I’m loving the Easter Banner. I have quite a collection of alphabet letters in many different themes. day and some of my favorites have Christmas and Halloween themes. Thanks for such a great idea. Love the graphics. Thank you for sharing Ann. Thank you, Ann. The colors are so springy – guaranteed to banish the winter blues! I’m making one today. Thank you for sharing this Ann. It will be hanging in my front window very soon. Hope you are enjoying some beautiful spring weather. Ann, you are awesome! Thank you for sharing your beautiful ideas. I agree with Peg !! You are awesome ! !